Here's the in-depth information you need to initiate designs for a variety of justice facilities, including law enforcement, adult detention, courts, corrections, juvenile and family justice, and multi-occupancy facilities. Features project photographs, diagrams and floor plans, and sections and details. Highlights such projects as Elgin Law Enforcement Facility in Elgin, IL; Federal Detention Center in Seattle-Tacoma, WA; Queens Family Court and Family Agency Facility in Queens, NY; and many more. 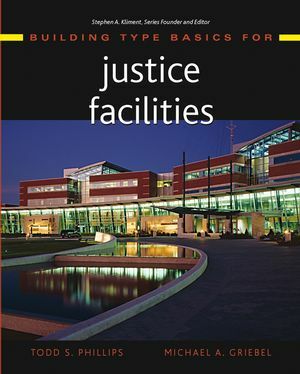 Combines in-depth coverage of the structural, mechanical, energy, cost information, safety, and security issues that are unique to justice facilities with the nuts-and-bolts design guidelines that will start the project off on the right track and keep it there through completion. TODD S. PHILLIPS, PhD, AIA, is a courts planning and research consultant and Director of the International Center for Courts Design Research, a nonprofit Organization based in Washington, D.C. He served as the director of the Center for Advanced Technology Facilities Design at the American Institute of Architects from 1992 to 2000. MICHAEL A. GRIEBEL is Senior Vice President of Architecture at Healy, Snyder, Bender & Associates, Inc. (HSB) in Chicago, Illinois. He has led the planning and design of more than 100 justice facility projects since 1980. 6. Juvenile and Family Justice Facilities. PART II: SYSTEMS AND ISSUES. 9. Mechanical, Electrical, and Structural Systems. 12. Costs, Financing, and Project Delivery. Appendix: Space Requirements for Justice Facilities.